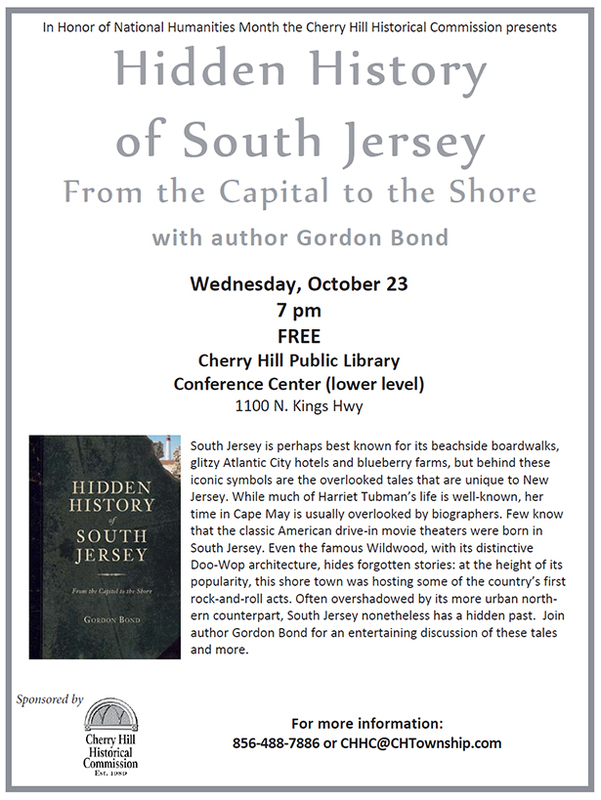 Hidden History of South Jersey - Oct. 23 at 7 p.m.
South Jersey is perhaps best known for its beachside boardwalks, glitzy Atlantic City hotels and blueberry farms, but behind these iconic symbols are the overlooked tales that are unique to New Jersey. While much of Harriet Tubman’s life is well-known, her time in Cape May is usually overlooked by biographers. Few know that the classic American drive-in movie theaters were born in South Jersey. Even the famous Wildwood, with its distinctive Doo-Wop architecture, hides forgotten stories: at the height of its popularity, this shore town was hosting some of the country’s first rock-and-roll acts. Often overshadowed by its more urban northern counterpart, South Jersey nonetheless has a hidden past. Join author Gordon Bond for an entertaining discussion of these tales and more. Sponsored by the Cherry Hill Historical Commission.